Published: Dec. 7, 2016 at 03:45 p.m. Updated: Dec. 8, 2016 at 09:35 a.m.
With the final stretch of the 2016 NFL season upon us, the Pro Bowl picture is shaping up. 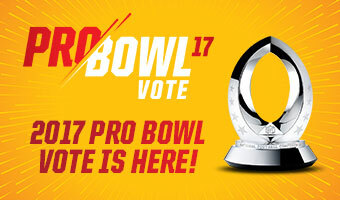 Before fan voting ends on Dec. 13, Chris Wesseling takes a look at the players who most deserve to make the Pro Bowl for the first time. Of course, it's not too late to add your vote to the mix. And make sure to tune in as the rosters are unveiled on NFL Network's "NFL Total Access: Pro Bowl Players Revealed" on Tuesday, Dec. 20 at 8 p.m. ET. 1) Dak Prescott and Zeke Elliott, Dallas Cowboys quarterback and running back: Do you remember the last time a pair of rookie teammates were legitimate MVP candidates? No? That's because it doesn't happen. The same team that finished last season with a 4-12 record is now riding an 11-game winning streak (a franchise best within a single season), a dramatic turnaround made possible by performances that rank among the greatest pro football has seen. With a TD-to-INT ratio (19:2) that has him on pace to break the NFL record, Prescott already has more games (10) with a passer rating of 100 or higher than any rookie in the Super Bowl era. He has saved his best performances for the closing minutes, flirting with a fourth-quarter completion percentage near 80.0 and a passer rating near 130.0 during the winning streak. Elliott is the beating heart of the league's most balanced, unstoppable offensive attack, threatening Hall of Famer Eric Dickerson's rookie records for rushing yards (1,808) and rushing touchdowns (18). Rookie or not, Elliott is already one of the most complete players at his position. He's one of the rare top-five picks to actually exceed the hype. 2) David Johnson, Arizona Cardinals running back: As it turns out, the Cardinals' offseason proclamations about Johnson's Hall of Fame potential and Marshall Faulk-like receiving ability weren't just another example of hyperbolic homerism. Johnson and Faulk (1998) are the only players to record at least 1,000 rushing yards and 700 receiving yards in the first 12 games of a season. Johnson and Edgerrin James (2000) are the only players with 100 or more yards from scrimmage in each of a season's first 12 games. With a strong finish, he has a chance to challenge Chris Johnson's single-season record of 2,509 yards from scrimmage. Along with the Bears (née Staleys), the Cardinals are one of two organizations that date back to the NFL's inception in Ralph Hay's Canton, Ohio hupmobile showroom nearly 100 years ago. Over that entire century-long span, Johnson is the lone player in franchise history with multiple seasons of 13 or more touchdowns. The reigning NFC Offensive Player of the Week boasts an unmatched combination of power, game-breaking speed, dynamic cutbacks and the route-running ability and sure hands of a wide receiver. 3) Landon Collins, New York Giants safety: Overqualified for Most Improved Player honors, Collins is making a serious run at the Defensive Player of the Year award in his second season. The 2015 second-round pick leads all NFL safeties in tackles (94), sacks (three), interceptions (five) and passes defensed (13). He has spearheaded a Giants defense that ranks second in the league in passer rating allowed (73.6) and sacks (21) since Week 7 after closing out last season in embarrassing fashion. A liability as a rookie, Collins ranked dead-last in Pro Football Focus' 2015 coverage grades. Down 10 pounds and making plays in true sideline-to-sideline fashion as New York's tone-setter, Collins is now vying with Eric Weddle for the top spot in PFF's metrics. 4) Mike Evans, Tampa Bay Buccaneers wide receiver: A stretch forward in football cleats, Evans ranks third in receptions (76), third in receiving yards (1,058) and second in receiving touchdowns (10) as Jameis Winston's go-to target. He's one of just five wideouts in history to post 1,000-yard seasons in each of his first three years. Overcoming a drop-plagued 2015 season, he has emerged as the chief competition to Julio Jones and Antonio Brown for the All-Pro's first team. Evans checks all of the boxes as a deep threat, red-zone weapon, sideline acrobat and ultimate third-down chain-mover for a surging Buccaneers squad. 5) Vic Beasley, Atlanta Falcons linebacker: The No. 8 overall pick in the 2015 NFL Draft flashed one of the league's quickest first steps as a rookie, but he was too easily overpowered by experienced offensive linemen. After switching to linebacker and learning a few tricks of the trade from veteran pass rusher Dwight Freeney, Beasley has been a nightmare for right tackles. He leads the league with five forced fumbles, and his 10.5 sacks are second only to Von Miller's 12.5. Along with cornerback Desmond Trufant and middle linebacker Deion Jones, the Falcons finally have a trio of stars around which to build their next great defense. 6) Casey Hayward, San Diego Chargers cornerback: We already knew the former Packers second-round pick was one of the premier free-agent acquisitions of 2016, but he didn't clinch Pro Bowl status until Week 13. Hayward shadowed Evans last week, limiting the Bucs superstar to two receptions, 16 yards and a 20.8 passer rating on four targets. Next Gen Stats tell us that Hayward allows just 1.9 yards of separation at the target this season, the stingiest mark for any starting cornerback. His sticky coverage shouldn't overshadow his ball skills, which have led to NFL highs in interceptions (seven) and pass breakups (24) this year. By any measure, Hayward deserves accolades for his role as the anchor in San Diego's secondary. 7) Kelechi Osemele, Oakland Raiders guard: When trailing in the second half or overtime this season, Derek Carr has thrown 13 touchdown passes versus zero interceptions as pro football's latest version of Captain Comeback. Watching Carr on NFL Game Pass in those situations, two things stand out: his lightning-quick release and an offensive line that functions as a veritable force field. Oakland's offensive line has allowed a league-low 12 sacks, four fewer than Dallas' more ballyhooed front five. More than just Carr's bodyguard, Osemele has been a dominant run-blocker, paving the way for Latavius Murray and rookie playmaker Jalen Richard. 8) Brandon Graham, Philadelphia Eagles defensive end: The recent struggles of Carson Wentz and the Eagles' offense shouldn't obscure Graham's star turn as one of the league's most disruptive pass rushers. Tailor-made for coordinator Jim Schwartz's "Wide-9" defensive scheme, Graham trails only Defensive Player of the Year candidates Von Miller and Khalil Mack in total QB pressures (sacks, hits and hurries) this season, per Pro Football Focus. "Graham's a great player," Bengals offensive lineman Jake Fisher raved in advance of last week's matchup. 9) Joey Bosa, San Diego Chargers pass rusher: Over the next month, you will hear arguments for Noah Spence, Leonard Floyd, Jalen Ramsey, Yannick Ngakoue or Keanu Neal as Defensive Rookie of the Year. This is utter nonsense. Don't let Bosa's underwhelming sack total (5.5) fool you. Eight games into his career, the draft's No. 3 overall pick has already cemented himself as a transcendent talent with a Khalil Mack-like impact on his franchise's outlook. He's the best player on the field in some games and a must-watch on every snap. Since Pro Football Focus began tracking players in 2006, Bosa has more QB pressures than any rookie pass rusher. He's a force of nature at the line of scrimmage. 10) Tyreek Hill, Kansas City Chiefs kick returner: Hill's Twitter handle -- @ImFasterThanYa -- is truth in advertising. The fifth-round rookie is the NFL's fastest player, blazing a 4.25-second 40-yard dash at West Alabama's pro day. Although he's drawn comparisons to Devin Hester for his dynamic ability on kickoff and punt returns, Hill is already a better receiver than the potential Hall of Famer. A former running back at Oklahoma State before his dismissal from the team led him to join up with Division II West Alabama, Hill has retained that elusive run-after-catch ability as a wide receiver with a growing role in Kansas City's offense. A football player with track speed, Hill is the most dangerous returner in the league this season. Also deserving: Lorenzo Alexander, OLB, Buffalo Bills; Cliff Avril, DE, Seattle Seahawks; Doug Baldwin, WR, Seattle Seahawks; Cole Beasley, WR, Dallas Cowboys; A.J. Bouye, CB, Houston Texans; Zach Brown, ILB, Buffalo Bills; Michael Crabtree, WR, Oakland Raiders; Jamison Crowder, WR, Washington Redskins; Melvin Gordon, RB, San Diego Chargers; Tony Jefferson, S, Arizona Cardinals; Marquette King, P, Oakland Raiders; Marcus Mariota, QB, Tennessee Titans; Jordan Reed, TE, Washington Redskins; Xavier Rhodes, CB, Minnesota Vikings; Darius Slay, CB, Detroit Lions; Telvin Smith, OLB, Jacksonville Jaguars; Brandon Williams, NT, Baltimore Ravens; Leonard Williams, DT, New York Jets; K.J. Wright, OLB, Seattle Seahawks.